President Maithripala Sirisena said that the government would facilitate multi-national companies such as Maersk A/S to expand container transshipment through the Port of Colombo as that would be of immense help to Sri Lankan economy. Furthermore the Maersk handles 20% of Twenty Foot Equitant Unit containers (TEUs) at the Port of Colombo and a bulk of Sri Lanka’s imports and export freight. 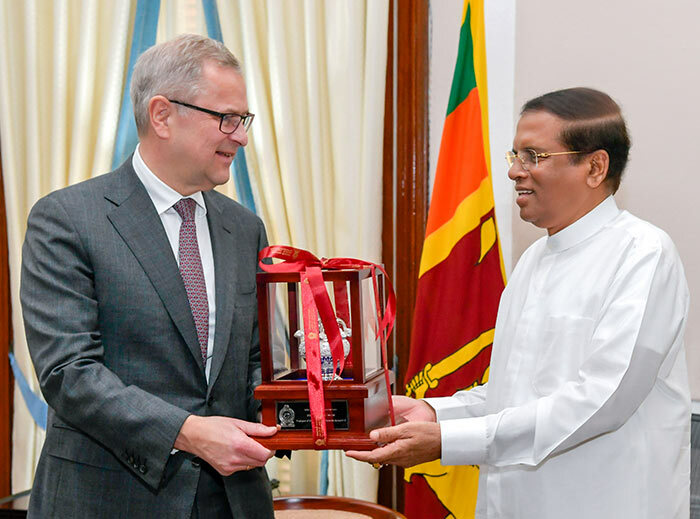 Maerks Chief Executive Officer Soren Skou called on President Sirisena at the Presidential secretariat today and briefed the President on the expansion plans of Maersk container handling in Sri Lanka. He said that Maersk’s business partner, South Asia getaway Terminal Pvt Ltd is holding discussions with the Ministry of Ports and Shipping and the Sri Lanka Ports Authority (SLPA) regarding the expansion of container transshipments in Sri Lanka. He said that a large segment of transshipments through Port of Colombo is for the Indian subcontinent.